So this is one of those impulse buys that for a craft beer explorer can go either way. A few things about this one got my attention. First and foremost, I hadn’t seen it before. Bottles like that typically find their way into my shopping basket and eventually my beer glass. Secondly, it’s from Cismontane Brewing Company, a local brewery in Rancho Santa Margarita. I like to support the local brews whenever possible. And third, it’s an IPA. Some say it’s the most boring kind of beer. However, most of us here at Beer Soaked are fans of the style… especially the West Coast India Pale Ale style. Grabbing this was a no brainer. 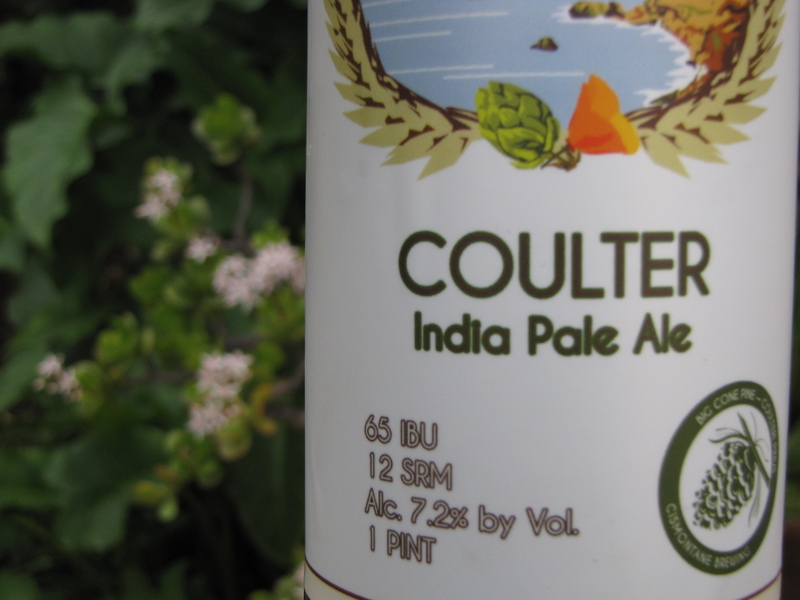 Coulter IPA is named after the Coulter (a.k.a. big cone) pine, a native species to Southern California. Designed as a well-balanced IPA on the fringe of the west coast style with more subtle hopping and brewed with a hit of rye for head retention and a deeper malt character. This brew has the best of all worlds, great hop flavor, a bold body, and refreshing taste. Silly me, I thought that Cismontane brews were only available on tap, so I was surprised when I found the bottle on the shelf at my weekly beer stop. The guy behind the counter didn’t know much about the beer either other than “We just got it in”. So I added it to my loot and headed home to give it a try. It poured a nice golden-amber color and had a decent head. The big pine smell was right up front and was exactly what I had expected after reading the label. If you name a beer after big pine cones you’d better deliver on the pine notes. Coutler India Pale Ale delivered on the big pine. It also had a smooth mouth feel and a well balanced flavor. This was a very good IPA and I’m looking forward to picking up another bottle soon. 3 1/2 caps from me. I’ll also be on the lookout for other Cismontane bottles now that I know they are at my local bottle shop. From the looks of their website (www.cismontanebrewing.com) they are still updating the site. In the meantime you can find them on Facebook, Twitter or Blogspot. They are currently under construction expanding their brewery and tasting room, and should have the beer flowing again soon. We can’t wait. 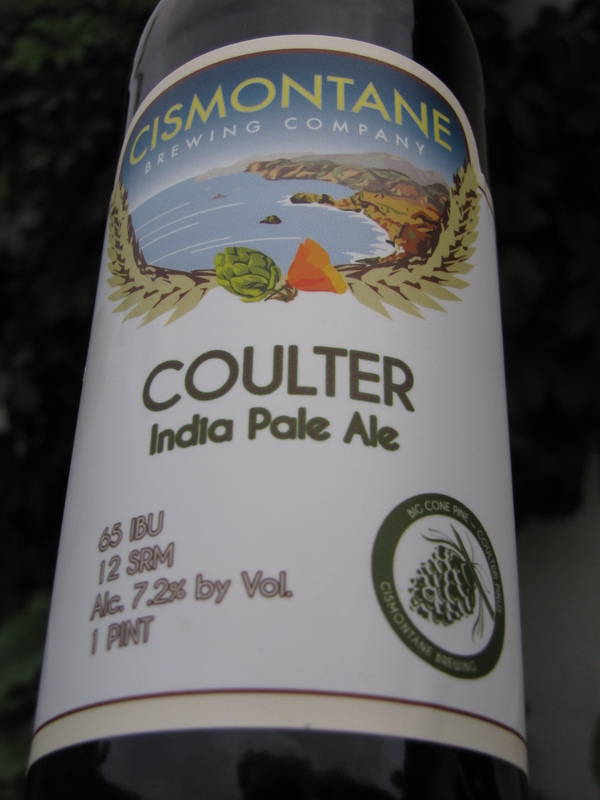 This entry was posted in IPA, Review and tagged 7.2%, Cismontane, IPA by Erik. Bookmark the permalink.